Kroeger Herb sent me some supplements for review. 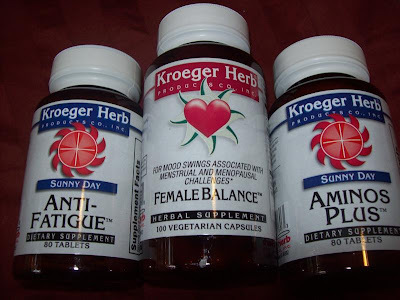 I chose the female balance, aminos plus, and the anti-fatigue. These supplements are made with natural ingredients which is great! I really like these supplements and will add them to my morning supplement routine! The company sells products for many of your different needs...just check em out! My favorite is the anti-fatigue supplement. Here is a little bit of information about it: "Our adrenal glands are the seat of our physical power. In dire circumstances adrenaline is secreted, giving the body extra strength. However, day-to-day stress can trigger the adrenals. Taking stimulants like caffeine further exhausts them. Anti-Fatigue is a unique vitamin formula designed to nourish your hard-working adrenal glands." I like this product because it gave me energy without a ton of caffeine! The companies products are affordable too! An 80 count bottle of the anti-fatigue costs $10.99. You can purchase these products online at Hanna's Herb Shop. The giveaway is for Circu Flow and Healthy Gut from Kroeger Herb. Circu Flow is a cardiovascular and heart health that has helped many people with heart conditions. Healthy Gut addresses leaky gut and digestive health which is a huge trend right now. The giveaway is open until Midnight on Friday October 1st. Winner will be chosen on Saturday October 2nd using Random.org. Visit the Kroeger Herb website and let me know what product interests you the the most! -Become a fan on Facebook of Hanna's Herb Shop (2 entries). Thanks for stopping by from FMBT and for the comment. Just poking around your blog here. I'm going to follow you. I think you've got something to offer a busy mom who's trying her best to be healthy! Happy Thursday! Can we hook me up to the Female Balance on an IV drip? Haha, definitely could benefit from that one! I'm your newest follower ! Would love for you to check out my blog and follow back! Hey! Thanks for the follow and for the comment! Following you back! Check back tomorrow for my "Feature me Friday" link party! I really like the Ginkgo Biloba Complete Concentrate! Thanks for stopping by yesterday via the Buzz on By Thursday party. Maybe you can take a sewing class, too. These vitamins sound good. I need to get better about taking vitamins routinely. Have a wonderful weekend!! to keep my sugar normal. I have always wondered about Ginko Biloba. I would be interested in trying their Ginkgo Biloba Complete Concentrate.